Working as a Sports Engineer means you get asked to work on some really exciting projects, designing a gravity racer or working closely with Olympic athletes. 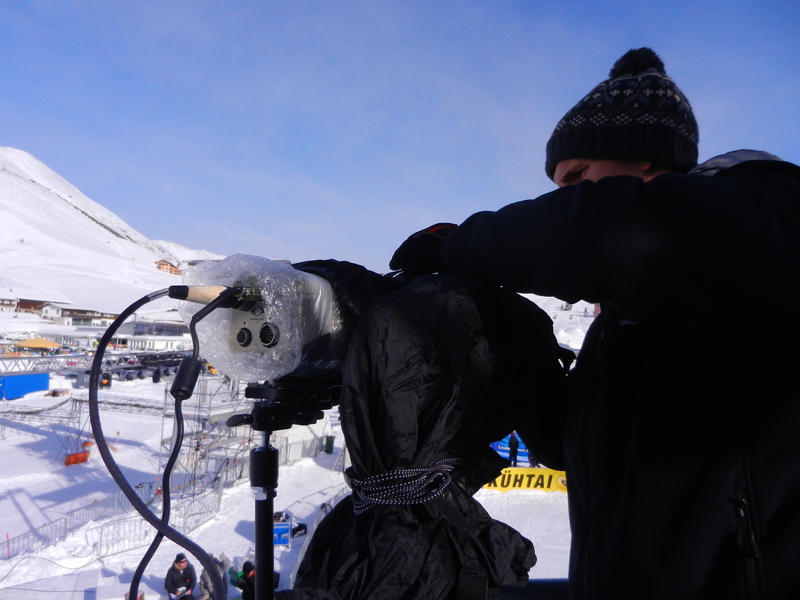 In January we got a phone call from TwoFour who produce the Channel 4 program ‘The Jump‘. The Jump pits 16 celebrities against each other over a series of grueling winter sports activities (skeleton bob, ski slalom etc.). At the end of each day of competition competitors are eliminated via a Eddie the Eagle style ski-jump — those who jump the furthest get to compete for another day. 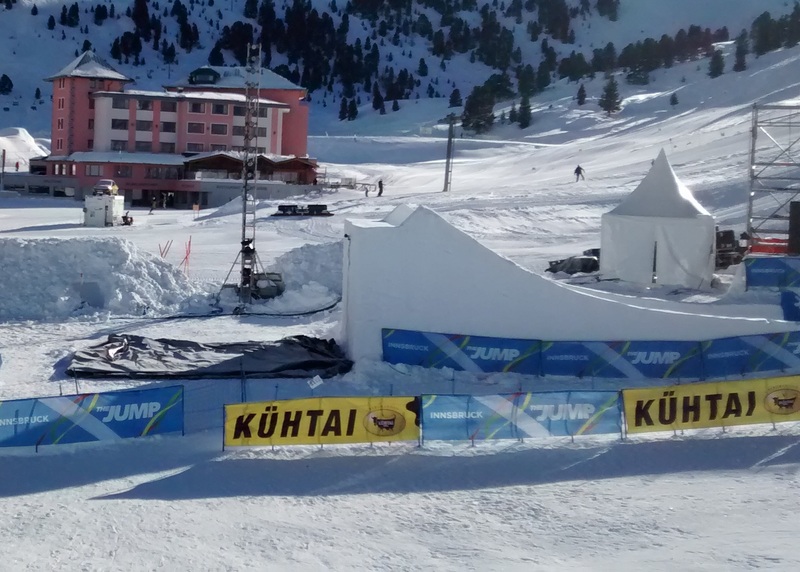 For the second series of the program a new eliminator event was added — the air jump — a huge 4 metre kicker onto a large air bag. This time the aim was the jump as high as possible, we’d been asked to measure the height of each jump. We’d worked on something similar before, back in 2011 we measured the jump height of dry-slope skiers and snowboarders who set a new world record. While the techniques would be the same, a whole new set of challenges awaited us. The best way to measure the jump height was using calibrated high speed video cameras. 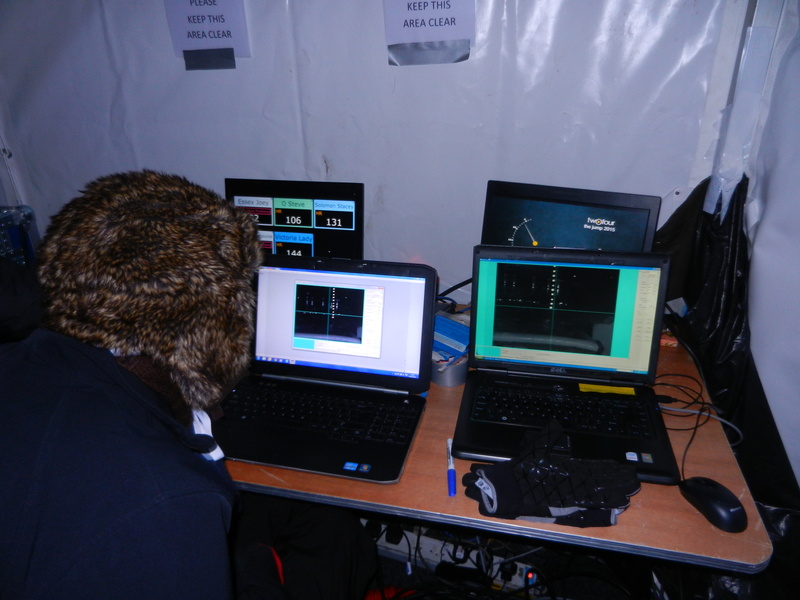 By recording the jump at high speed we’re able to pinpoint the moment the competitor reaches their apex. A calibration allows us to convert the pixels we measure in the image into metres height from the ground. There were quite a few steps to work through and due to the tight schedule an answer was required within 15 seconds! Appropriately positioning and adjusting the cameras is essential to obtain an essential measurement. Ideally the camera should be perpendicular to the kicker — giving a measurement plane aligned with the jump direction of each competitor. We attached our cameras to a lighting gantry which was excellently positioned around 40 metres from the kicker. The lens should be zoomed in as much as possible; the larger an object is in the image the more precise your measurement. This is a compromise, your captured images should contain some point of reference (in this case the edge of the kicker itself) and should also be able to capture the full range of expected jump heights (this ranged from possibly falling off the edge to launching into low orbit) — any change in camera settings required us to re-calibrate the system. In the end we had a shot which would be able to measure jump heights of around 4 metres to around 8 metres. In order to obtain an appropriate pixel/metre calibration factor we recorded an image of a large object of known length (in this case a 2.5 m wooden pole). 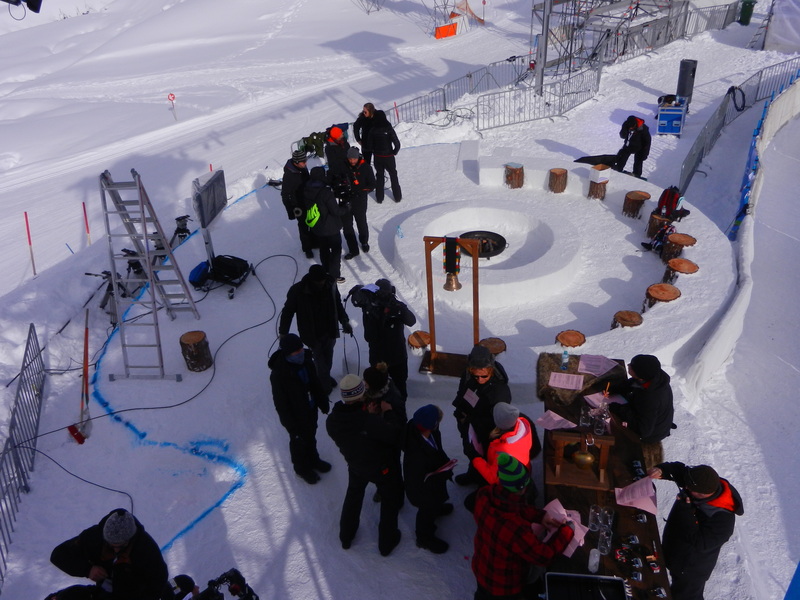 The bar and snow circle where the celebrities would be during the live show. Our testing tent was only a metre or so to the left of this shot. After a couple of practices and rehearsals we had our system ready to go. We’d worked hard to ensure we had all the appropriate cables feeding to all the appropriate locations, we were now crossing our fingers that our network cables didn’t snap in half due to the extreme cold. We’d managed to secure some space in a tent close to the live studio which protected us from the extremes of the weather. Nerves were high and our hands shook with a combination of adrenaline and mild hypothermia. We’d set-up two cameras next to each other to record each jump; missing a recording wasn’t an option. We were both focused intently on our laptop screens for the cue we needed. As soon as a celebrity began their slide towards the kicker we would spring into action and enact our well rehearsed process of clicking, scanning, choosing and measuring — all in 15 seconds. As could probably have been predicted, each jump came down to a handful of centimetres (with one jump being decided by only 3). After preparing for vastly different jump heights our system was being tested to its limits. To ensure fairness and accuracy we both assessed jump height and came to a consensus before taking the measurement. While we were confident in our result it didn’t stop the feelings of guilt when stating which celebrity would be knocked out of the competition. 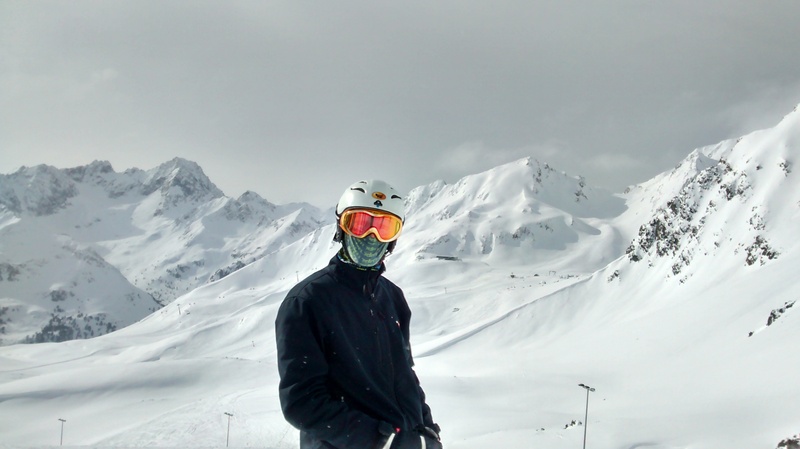 Our time in Austria was a great experience and tested us and our equipment to the limits. I can’t wait to see if there’s another series next year! Great story Simon, just like I remembered it!